Being one of the biggest and best online casino slot providers in the UK, we felt it was appropriate for us to understand our customers to the best of our ability. That’s why here at Wizard Slots we conducted a little research into levels of problem gambling. In order to do this we knew we had to use data of a high validity and reliability. To ensure the information we are using and providing is as accurate as possible. So, we used the Gambling Industry Statistics Report from last year as our main source of statistics. Gambling – a hobby or issue? The UK slot games and gambling sector has for decades been shrouded with negative stigmas and stereotypes. 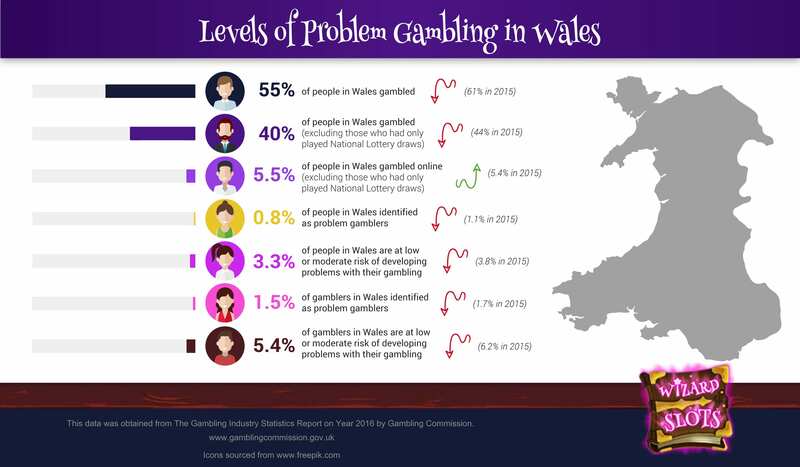 From our findings this is something that is continuing, it may even be causing the fall in welsh gamblers. As the total people in wales who gambled fell by 6% from 2015 to a total of 55%. Within this there was 15% of people who only played national lottery, so a total of 40% of people in wales who had gambled at online casinos or slot sites. The world of online gambling had only taken up for a very small percentage. As just 5.5% of people in wales gambled online. One of the most interesting statistics we found was that despite the negative associations, problem gambling was relatively low. Totaling only 0.8% of people in wales who identify as have a problem with gambling. Which was also a statistic rapidly shooting down by from 1.1% in 2015. The reports are overall show that the consistent negative stereotypes surrounding gambling are dated and invalid. As problem gambling levels have fallen, the vast majority of players are able to play and maintain a healthy and happy lifestyle as they play some of their favourite online games.